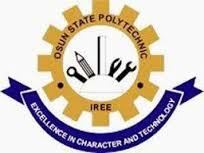 Osun State Polytechnic Iree OSPOLY Resumption Date and Commencement of Academic Activities for Full-Time and Daily Part-Time, DPT Students for 2018/2019 Academic Session. The management of Osun State Polytechnic Iree has directed all Principal Lecturers, Deans, Directors, HODs and Coordinators of Daily Part Time program of the Institution to resume and commence academic activities as from Monday 28th January, 2019. This is contained in a release signed on behalf of the Instruction’s Registrar, by Mr. Tope Abiola, the Media Relations Officer, he directed all Part Time Academic Staff of the polytechnic to resume promptly for their normal duties.